I am working on a three-fold strings and crumbs project now. By that I mean, three projects at once! I finally decided on what to do with these blocks. Boy was it tough to decide! The strings one is actually Strings 3 - as I started and worked on these blocks last fall until I was discouraged as I couldn't come up with a design I liked. Instead of ditching them, I put them aside and hoped that something would strike my fancy.Now I have two plans. One for these with red strips and one for another one using a white or cream instead of the red. This is what it would look like! Just to get myself back in the swing of this project, I made up 2 of these strings blocks. They are sewn to a backing fabric that is about 10" square. I made it difficult for myself by making some strings blocks that were up and down. This means that all my strings need to be long. Grr. Why did I do that? First I have to make a plain strings block and then I'll make half square triangles with red - and then I'll make an hourglass block out of them. Of course each time I do that, they get smaller! by making some smaller blocks with some white or off white. These will be using 6" finished blocks - and so I'll need quite a few. But it will be easier because my strings won't need to be quite as long. Isn't this plan cool? I like it! I kind of wish I would allow myself to start it now, but I won't. I want to finish this red one first as I already have 30 of the blocks almost ready to go. I'll no doubt make it bigger than it is shown here. I'm still thinking "out loud" for you to see. This plan alternates the hourglass block shown above in red with a block that only has strings on 1/4 of it - the rest is white. This gives more place for the eye to rest. And maybe that's why I like it. Remember...I'm trying to "like" strings. 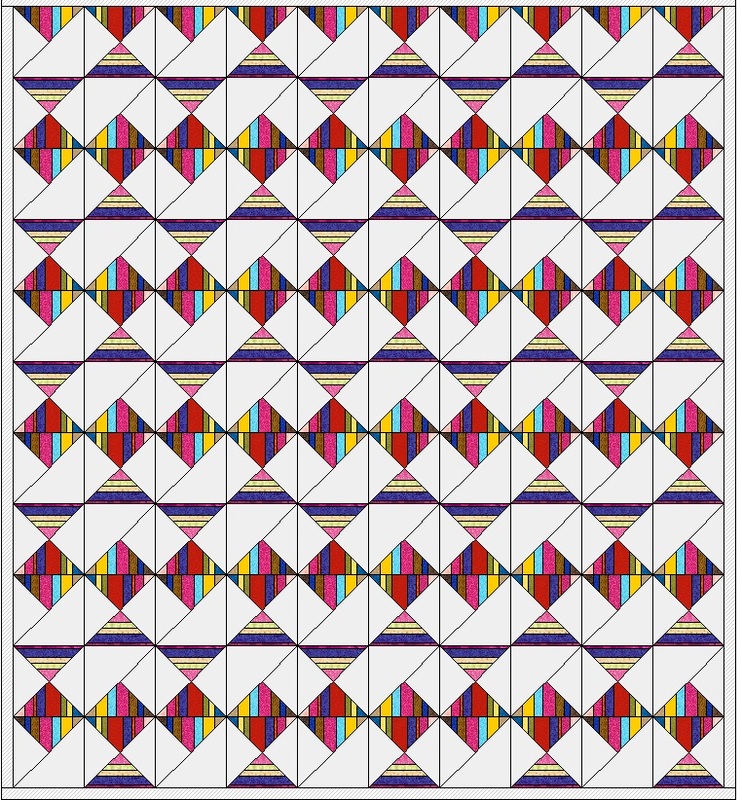 Many strings quilt patterns I'm just not overly thrilled about. They still aren't my preference, but that's where the challenge comes in-- I'm trying to figure out ways to use up my strings so that they are acceptable to me. If you are a natural strings lover, then just bear with me - I'm not. However, I realize they are valuable pieces of fabric and it pains me to throw them away! I read somewhere that at $12/yard that 2" strip is worth something like $0.60! My calculations say it is more like $0.66! Throwing them away is like throwing away money. i sewed another tape full - so I do have quite a bit ready to go. Secondly, I decided to spend some time sewing upcycled blues scraps onto to adding machine tape. I'm going to work hard and try to make several yards of it. I'd like to make it up soon. The next blues crumbs one is going to be something along the order of these two. They are very easy--I made both of these back in 2013. 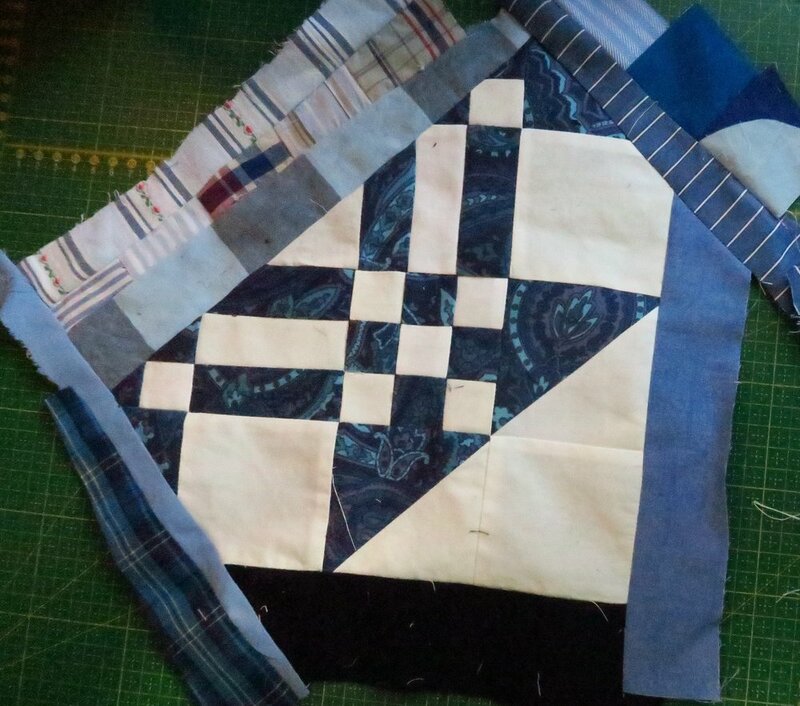 I'm eager to try it again only this time do some walking foot straight line quilting on the diagonal across the design of the strips. I think it will be nice and make it look more "modern". "Modern" is something else that doesn't come naturally to me - and that's okay. I'm just intrigued by how different it would look with different quilting. So we'll see how it looks with the blues instead of all the colors as shown. Won't that be cool? That means, it can be blues, or that leftover purple pieces or greens or even reds and tans--anything I used in these upcycled blues quilts. Thirdly - another blues crumbs one - '"A Hot Mess"
This week as I've been actually collecting all my leftover leftovers of the blues into a large trash bag, ALMOST ready to toss, but not able to make myself take them to the fireplace - I decided to go ahead and make at least one more crumbs one out of those pieces. Once again, I'll use anything in the bags from all the previous blues quilts - cutoffs, small pieces, odds and ends, etc. Because I've used purples, greens, reds, tans, etc. I'll be able to throw some of those colors in the crumbs blocks. I'm showing you a few closeups of the blocks so you can see what I'm cutting from. There are leftovers from Granny's Checkerboards, You're Covered, the one I just showed you on Saturday, etc. 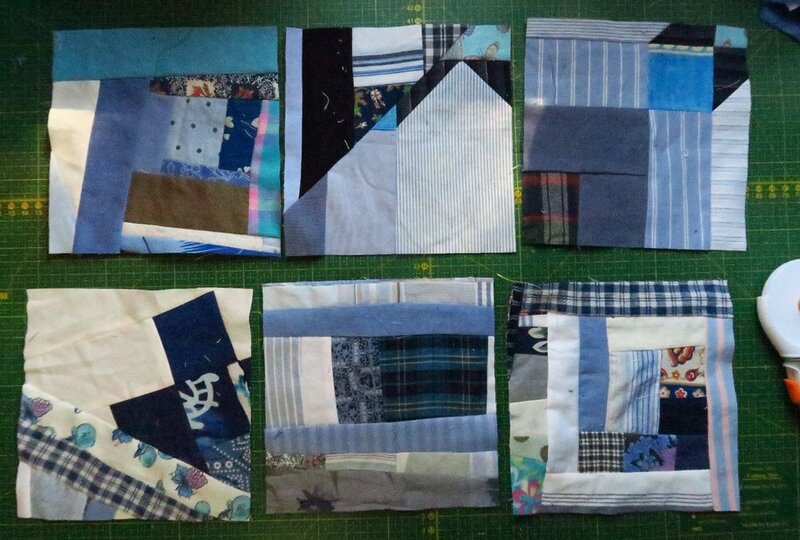 I am making square or rectangles of scraps and this week I cut them into 6.5" squares. I think next week I'll go for 3.5"x 9.5" rectangles and see what happens when I add them to the middle. This is where I am. I did end up making up 12 blocks so far. So will I like it? So far it is 18"x24". I'll try to add to it weekly until it is the size I want. This is going to be like a "free quilt" as I am so ready to toss these pieces into the fireplace! I think this top will also be a heavy one. We'll see. I'm going to show you this one as it grows as I hope to add to it weekly. I started by making 6.5" squares - but I'll make whatever size blocks I want - but keep them to 3" increments, so 3.5", 6.5", 9.5" or 12.5" squares or rectangles as I add to the center. Note: I'll be getting back to the Woven Stars. I need to print out more of the papers to work from and I've been focusing hard on these blues. I've not forgotten. And that's where I am with my strings and crumbs update for this weekend! I trust you are having a good day wherever you are reading this!